In the Marine Corps, metal workers are welders who repair a variety of equipment. It's up to them to determine what materials, tools and personnel are needed to complete a given welding job, and to map out the sequence of operations, so welding work is completed in a timely and safe manner. The Marines considers this a primary military occupational specialty and categorize it as PMOS 1316. It's open to Marines between the ranks of private and staff sergeant. In addition to welding metal on Marine Corps equipment and vehicles, these Marines install, operate, maintain and repair various metal materials. Part of their duties involves examining drawings and work orders. After basic training, also known as boot camp, these Marines take the basic metal workers course at the Army Ordnance School at Aberdeen Proving Grounds in Maryland. 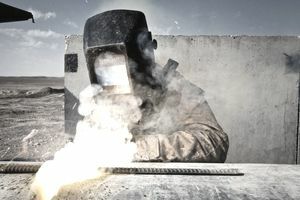 Marines in this job will learn the fundamentals of welding, including the basics of oxy/acetylene welding, shielded metal arc welding, gas Tungsten arc welding, and gas metal arc welding. They'll learn how to do LAV armor plate repairs, and take courses in titanium welding and safety inspections. To be eligible for this Marine Corps job, you'll need a score of 95 or higher on the mechanical maintenance (MM) segment of the Armed Services Vocational Aptitude Battery (ASVAB) tests. You need normal color vision (no colorblindness). There's no Department of Defense security clearance required for this job. Much of what you do in this job will be specific to the Marines, but the skills you learn will be useful in a variety of civilian jobs. You should be well-qualified to work as a welder or welding supervisor at a construction site or other company. How Do You Become a Fire Support Marine?